You can never go wrong with flowers incorporated in to your wedding jewellery. How effortlessly chic are the Posy wedding earrings. These Flower Wedding Earrings will inspire and delight you. A natural way to highlight your wedding bouquet or floral lace on your wedding dress. A mixture of diamonties surrounding the pearl centre of the flowers. These wedding earrings are great to team with wedding dresses that have pearl detailing. Match with the matching posy necklace or a simple vintage pearl necklace. Why not mix it up and wear our chic rosary bracelet. Wedding jewellery made with love. These sparkling earrings come in our signature Hello Lovers Australia pink box. 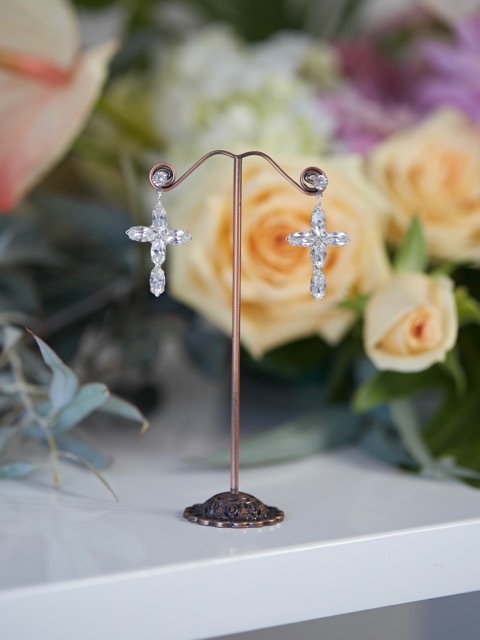 Think about gifting these earrings to your bridesmaids the night before your wedding. Such a thoughtful gift, I know i would love to get these flower wedding earrings as a gift.